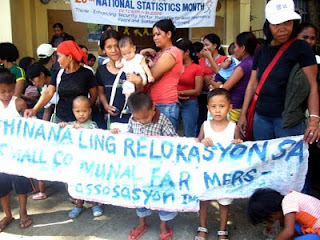 Photos sent to the Mindanao Examiner by the Anakpawis party list group show evicted residents during a rally Thursday, October 15, 2009 in Davao City in Mindanao. DAVAO CITY, Philippines (Mindanao Examiner / October 15, 2009 - Some 100 people whose houses were demolished in Davao City in Mindanao held a rally on Thursday demanding the government to provide them a relocation site and housing facilities. Many of those who joined the rally were from the village of Bago Oshiro in Talomo District. Their houses were demolished in May after the landowner evicted them, saying their stay in the area was illegal. Since then, the residents have been living in shanties and squatting along the village road. They have been demanding housing from the government, but their pleas were ignored. A spokesman for the group, Florencio Jarantilla, Sr., said their shanties could hardly stand heavy rains. And there are no sanitary toilets and water source is far. He said they have no electricity and their children have stopped going to school since they lost most of their belongings during the eviction. A local Anakpawis party list spokesperson Franchie Buhayan said whose group is helping the residents said the demand of the Bago Shiro community is legitimate and urged the local city housing agency to respond to the calls of the homeless families urgently. 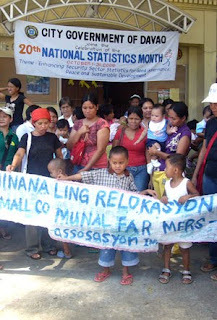 “The government must appropriate the bigger portion of the national budget for basic social services such as housing, education and health and not on foreign debt servicing which atrociously takes up one third of the entire budget,” Buhayan said, adding that of the 1.5 trillion pesos of the national budget, some 340.8 billion are paid to foreign debts. Buhayan said that as long as foreign debt servicing remains to be the priority of the Philippine government - instead of ensuring the Filipino people’s welfare - problems on health, education and housing will continue to plague the people.